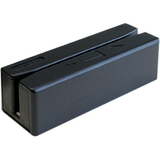 The Unitech MS246 is an intelligent, programmable magnetic stripe reader that provides a wide range of functionality and value in a convenient package size. The entire unit is just 100mm long, about the length of a credit card. It reads up to three tracks of information with a single swipe in either direction, and has a beeper and three-color LED indicator to signal a successful read. The MS246 provides easy USB connectivity and OPOS driver support, and it is programmable so that the data format and output can be configured to match application and communication requirements.